MicroRNAs are tiny RNAs that do not encode proteins. Instead, they regulate the expression of genes by preventing protein-encoding messenger RNAs from being translated into protein. MicroRNAs are expressed throughout the body, including the heart, where the most abundant microRNA is called miR-1. This is encoded by two nearly identical genes: miR-1-1 and miR-1-2. Mice that lack the miR-1-2 gene have various heart abnormalities, but generally survive because they still produce some miR-1 from their remaining miR-1-1 gene. Now, Heidersbach et al. have generated the first mice that specifically lack both miR-1 genes, and shown that these animals die before weaning. When viewed under the electron microscope, heart muscle from miR-1 double knockout mice lacks the characteristic ‘striped’, or striated, appearance of normal heart muscle. Additionally, miR-1 double knockout hearts have some gene expression characteristics more similar to the smooth muscle found in the gut and in the walls of blood vessels. Smooth muscle differs from striated muscle in that it lacks sarcomeres: these are bands of fibrous proteins, such as myosin, that are essential for muscle contraction. In normal mice, an enzyme called MLCK contributes to the formation and function of sarcomeres by adding phosphate groups to myosin molecules. By contrast, in smooth muscle an enzyme called Telokin promotes phosphate group removal, and thus affects the function of sarcomeres. Heidersbach et al. showed that miR-1 interacts directly with Telokin mRNA to prevent its expression in the heart, and simultaneously represses a protein called Myocardin, which directly activates transcription of Telokin. However, when miR-1 is absent, as in the miR-1 double knockout mice, Telokin is expressed in heart muscle, along with many other genes characteristic of smooth muscle. As well as improving our understanding of the development and functioning of the heart, these findings should shed new light on the role of microRNAs in maintaining the patterns of gene expression that characterize unique cell fates. Cardiac gene expression is cooperatively regulated by an intertwined network of transcription factors and microRNAs (miRNAs) (Srivastava, 2006; Cordes and Srivastava, 2009). Perturbations in the activity or expression of factors within this network result in cardiac structural and functional defects in animal models and in humans. Among these, serum response factor (SRF) and Myocardin (Myocd) cooperate to directly regulate the myogenic gene program in both cardiac and smooth muscle (Treisman, 1987; Wang et al., 2001; Chen et al., 2002; Sepulveda et al., 2002 reviewed in Wang and Olson, 2004). These factors transcriptionally regulate numerous miRNAs that, in turn, regulate transcription factors to reinforce specific cellular decisions and behavior. (Kwon et al., 2005; Zhao et al., 2005; Niu et al., 2008; Cordes et al., 2009). miRNAs are small, ∼21 nucleotide (nt), single-stranded RNAs that negatively regulate the stability and translation of mRNA transcripts. miRNAs target sequences within the 3′ UTRs of mRNA transcripts that are highly complementary to the miRNA seed sequence (nt 2–8) and have imperfect complementarity outside of the seed region (Valencia-Sanchez et al., 2006). Due to the degenerate nature of miRNA:mRNA interactions, a single miRNA may have hundreds of mRNA targets (Bartel, 2009). Often miRNAs target multiple genes in a common pathway, thereby amplifying the effect of an individual miRNA on a given biological process (Fish et al., 2008; Cordes et al., 2009). microRNA-1 (miR-1) is a highly conserved miRNA and its expression is enriched specifically in cardiac and skeletal muscle. In mice, it is expressed in the heart and somites of the developing embryo during myogenic differentiation, beginning around embryonic day (E) 8.5 (Zhao et al., 2005; Liu et al., 2007). The cardiac expression of miR-1 increases during development, with a dramatic rise in the postnatal period. RNA sequencing has revealed that miR-1 is the most abundant miRNA in the adult mouse heart, representing up to 40% of all miRNA transcripts (Rao et al., 2009). miR-1 is transcribed as part of a bicistronic cluster with another striated muscle-enriched miRNA, miR-133a. In the genomes of most mammals, a duplication event has occurred resulting in two copies of the miR-1/133a locus, with miR-1-2 and miR-133a-1 on chromosome 18 and miR-1-1 and miR-133a-2 on chromosome 2 of the murine genome (Figure 1—figure supplement 1). Both precursors are transcriptionally regulated by several key myogenic transcription factors, including Myogenin, MYOD, SRF, MYOCD (Kwon et al., 2005; Zhao et al., 2005; Rao, 2006) and MEF2 (Liu et al., 2007). When processed, both the miR-1-2 and miR-1-1 precursors give rise to identical mature miR-1 species, suggesting evolutionary pressure on both alleles (Figure 1—figure supplement 2). An additional miRNA cluster encoding miR-133b and miR-206 is expressed uniquely in skeletal muscle, with the mature sequence of miR-206 sharing a common seed with miR-1, but varying by 4 nts outside of the seed region. Deletion of miR-1-2 in mice (Zhao et al., 2007), which reduces the total expression of cardiac miR-1 by roughly 50%, results in a spectrum of cardiac defects on a pure 129 background, including incompletely penetrant lethality, cardiomyocyte proliferative defects, and electrophysiological abnormalities. In flies, loss of the single miR-1 gene results in abnormal myogenic differentiation and cell polarity defects in cardiac progenitors (Kwon et al., 2005; Sokol, 2005; King et al., 2011); however, the consequences of complete loss of miR-1 in mammals are unknown. In this study, we report that targeted deletion of the miR-1-1 locus results in a phenotype similar to that described for miR-1-2 null mice, and that the complete loss of miR-1 is uniformly lethal before weaning due to cardiac dysfunction. We show that the loss of miR-1 results in perinatal heart failure with myocardial sarcomeric defects, hypophosphorylation of Myosin Light Chain 2, and ectopic expression of Telokin, a smooth muscle-restricted inhibitor of Myosin Light Chain 2 phosphorylation. Furthermore, we found the SRF co-factor, MYOCD, which is critical for transcriptional activation of both the cardiac and smooth muscle gene programs in vivo (Li et al., 2003; Hoofnagle et al., 2011; Wang et al., 2001; Chen et al., 2002), is directly targeted by miR-1. The smooth muscle isoform of Myocd was preferentially upregulated in the absence of miR-1 and likely contributed to ectopic activation of the smooth muscle gene program in the heart. 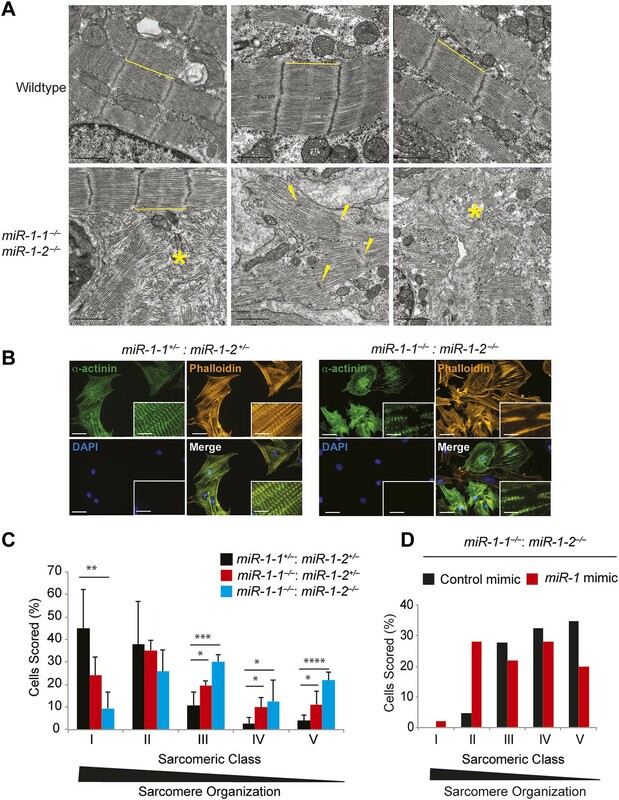 Our findings reveal that miR-1 is embedded in an SRF-dependent cardiac gene program that promotes sarcomerogenesis and myogenic differentiation, while simultaneously repressing the smooth muscle program. We used homologous recombination to delete one allele of the miR-1-1 precursor in embryonic stem (ES) cells, with a floxed neomycin cassette used for positive selection. (Figure 1—figure supplement 3 and ‘Materials and methods’). Injection of targeted ES cells into blastocysts resulted in high-percentage chimeras that transmitted the targeted allele through the germline. Intercrosses of miR-1-1 heterozygous mice revealed that approximately half of all miR-1-1 homozygous-null mice died before weaning when bred onto a pure 129 strain, similar to miR-1-2 null mice (Figure 1A, upper). This lethality was strain dependent, as miR-1-1 null animals on a mixed background (129/BL6) survived at normal Mendelian ratios until weaning. (Figure 1A, lower). By quantitative RT-PCR (qPCR), we found that total cardiac miR-1 levels were decreased in miR-1-1 knockout animals by about 40% at postnatal day (P) 2 (Figure 1B). Viability and cardiac function of miR-1-1−/− mice. (A) Genotypes of offspring generated from miR-1-1+/− intercrosses on either a pure 129 background (upper) or a mixed BL6/129 strain (lower). Numbers of expected and observed genotype ratios are given for weaning-age (3-week-old) pups. (B) qPCR of mature miR-1 and miR-133a in post-natal day 2 hearts. N = 6 per genotype. (C) Analyses of cardiac function by echocardiography of adult animals of indicated genotypes on a pure 129 background. N = 5 per genotype. LVEDD, left ventricular end-diastolic dimension; LVESD, left ventricular end-systolic dimension. (D) Adult wildtype (upper) and miR-1-1−/− (lower) hearts on a pure 129 background (I). RA, right atrium; LA, left atrium; RV, right ventricle; LV, left ventricle. Hematoxylin and eosin images taken at 1.25X magnification (II); and 40X magnification; scale bar indicates 25 μm (III). Masson trichrome stain of miR-1-1 knockout myocardium, images taken at 40X; scale bar 50 μm (IV) (E) Analyses of cardiac conduction by electrocardiogram (EKG) of adult animals of indicated genotypes on a pure 129 background. *p<0.05; **p<0.01; ns, not significant. To evaluate cardiac function, we performed echocardiography on adult miR-1-1 null or wild-type littermates. We found a reduction in fractional shortening, as well as an increase in left ventricular end-diastolic and end-systolic dimension in the miR-1-1 knockout animals, indicating ventricular dilation (Figure 1C). Mild ventricular dilation was confirmed histologically (Figure 1D I and II). Additionally, we observed areas of fibrosis in the ventricular myocardium of the miR-1-1 knockouts (Figure 1D III and IV). Like miR-1-2 knockouts, miR-1-1 knockout animals exhibited subtle conduction abnormalities, including prolonged ventricular depolarization and repolarization, indicated by a broader QRS complex and longer QT interval than controls. Additionally, miR-1-1 knockout mice showed broader P waves without alteration of the PR interval (Figure 1E, Figure 1—figure supplement 4). Intermittent atrial arrhythmias were observed in two of five knockout animals analyzed, but were not observed in wild-type animals (Figure 1—figure supplement 5). Thus, mice lacking miR-1-1 were grossly similar to those lacking miR-1-2, in that they exhibited partial lethality as well as subtle conduction abnormalities. Cardiac conduction defects in the miR-1-2 knockout mice were at least partially ascribed to dysregulation of the miR-1 target, Irx5. Similarly, we found that Irx5 was upregulated in the miR-1-1 knockout mice (Figure 1—figure supplement 6). miR-1-1 knockout mice also had a partial decrease in mature miR-133a levels (Figure 1B). Previously, using semi-quantitative RT-PCR, the miR-133a precursor levels were reported to be unchanged in the miR-1-2 knockout animals. In this study, the analysis of the mature species by qPCR revealed a slight decrease in miR-133a in weaning-age miR-1-2 null hearts, although not statistically significant (Figure 1—figure supplement 7). Importantly, miR-133a expression was maintained at a level described to be inconsequential in previous reports (Liu et al., 2008). To investigate the consequences of complete loss of miR-1, we intercrossed miR-1-1 and miR-1-2 mutant mice (Zhao et al., 2007) to generate double-heterozygous mice in a 129/BL6 mixed background. At weaning, no lethality was observed in the double-heterozygous mice (Figure 2—figure supplement 1) similar to the miR-1-1 knockout on a mixed background. Using gene expression microarray analyses, we found 201 genes that were dysregulated in the single knockouts or double-heterozygous mice (Figure 2—figure supplement 2). Of those, 24 genes were coordinately dysregulated in animals of all three genotypes. The majority of genes (195/201) were similarly altered between the double heterozygotes and at least one of the single knockouts. There were, however, some differences in gene expression between these groups, which may suggest minor functional differences of the miR-1 loci. Double-heterozygous mice were subsequently intercrossed to generate knockout animals with only a single intact allele (miR-1-1−/−: miR-1-2+/− and miR-1-1+/−: miR-1-2−/−). Most of these mice were viable and fertile on the mixed background, though mice lacking both the copies of miR-1-2 were under-represented at weaning (Figure 2—figure supplement 3), indicating some difference in the compensatory ability of the two loci. Single-allele mice (¾ alleles knocked-out) were intercrossed to generate mice completely lacking miR-1. miR-1 compound-null mice on a mixed background were born at slightly less than Mendelian ratios and were of normal birth weight (Figure 2A, Figure 2—figure supplements 4 and 5). Roughly a quarter of the double-knockout animals died very soon after birth. In a subset of these animals, we observed ventricular septal defects (VSDs) and misalignment of the aorta over the ventricular septum (overriding aorta), likely accounting for their lethality (Figure 2—figure supplement 6). Surviving miR-1 double-knockouts failed to thrive post-natally, with no double-knockout animals surviving beyond P10 (Figure 2B, Figure 2—figure supplement 5). Examination of surviving miR-1 double-knockouts revealed expansion of the superior portion of the right ventricle (conus) and enlargement of the atria, when compared to wild-type mice beginning at P0 (Figure 2C, asterisk). By P4, and more extensively by P10, the dilation of all cardiac chambers was observed, with a particularly notable enlargement of the right atria. Echocardiography revealed severely impaired fractional shortening by P2 (Figure 2D and E) with poor systolic function. Frequent ventricular thrombi were observed by P4, consistent with impaired cardiac function in these animals (Figure 2C). Functional analysis of the conduction system by electrocardiogram (EKG) revealed a spectrum of abnormalities, including a prolonged QRS complex, and prolonged PR and QT intervals (Figure 2F, Figure 2—figure supplement 7). The presence of frequent sinus pauses was observed in all knockout animals analyzed (Figure 2—figure supplement 8). These morphological, functional, and electrophysiological data indicate that the postnatal lethality in miR-1 knockout animals is due to cardiac dysfunction. Compound miR-1 knockout mice exhibit lethality due to a spectrum of cardiac defects. (A) Genotypes of offspring generated from miR-1-1−/+:miR-1-2−/− X miR-1-1−/−: and miR-1-2+/− intercrosses on a mixed BL6/129 background. Numbers of expected and observed genotype ratios are given for post-natal day 0 (P0) and weaning-age (3-week-old) pups. (B) Kaplan-Meier survival curve of miR-1 double-knockout animals and double-heterozygous littermates. (C) Abnormal cardiac morphology in postnatal miR-1 double-knockout mice includes an elongated outflow tract, as evidenced by bulging of the conus at P0 (asterisk). By P4, chamber dilation and thinning of the myocardium was apparent and ventricular clots were commonly observed. RA, right atrium; LA, left atrium; RV, right ventricle; LV, left ventricle. Middle panel images taken at 1.25X magnification; lower panel images taken at 40X magnification. (D) Echocardiography showed abnormal cardiac function in P2 miR-1 null compared to wild-type animals. N = 7 for wild-type mice and N = 4 for miR-1 null mice. LVEDD, left ventricular end-diastolic dimension; LVESD, left ventricular end-systolic dimension. (E) Representative M-mode image by echocardiography indicating diastolic and systolic dimensions. (F) Electrocardiographic analysis revealed conduction abnormalities in miR-1 double-knockout animals by P2, including a decreased heart rate and elongated QRS relative to wild-type controls. *p<0.05; **p<0.01; ***p<0.001;****p<0.0001; ns, not significant. qPCR confirmed that miR-1 was not detectable in hearts of miR-1 compound-null mice. Notably, miR-133a expression was decreased in miR-1 double-knockout animals with the dysregulation of miR-133a becoming more pronounced with age as the locus normally becomes more actively transcribed (Figure 2—figure supplement 9). As miR-1 lies transcriptionally upstream of miR-133a, we cannot exclude the possibility that the decrease in miR-133a expression is in part due to impaired transcriptional read-through downstream of the miR-1 targeting event. However, chromatin immunoprecipitation revealed reduced RNA polymerase II (Pol II) occupancy at the miR-1-1/miR-133a-2, and miR-1-2/miR-133a-1 promoters in P2 miR-1 double-knockout mouse hearts, suggesting that transcriptional initiation of these loci is reduced secondary to loss of miR-1 expression (Figure 2—figure supplement 10). This suggests a feedback mechanism whereby miR-1 maintains appropriate expression of the miR-1/133a loci. 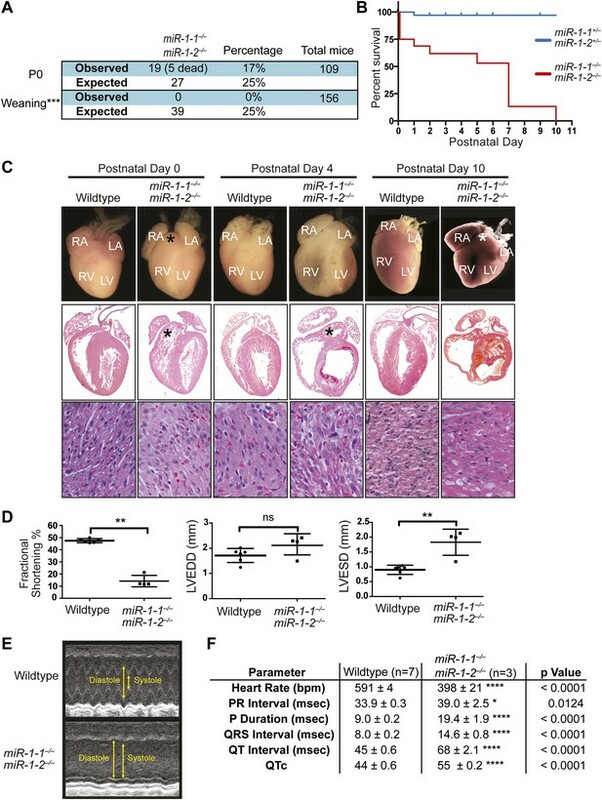 Given the relatively normal cardiac morphogenesis in surviving miR-1 knockouts, we hypothesized that their impaired cardiac contractility was due to a primary myocardial defect. In agreement, transmission electron microscopy of ventricular tissue revealed the areas of extensive sarcomeric disruption at P0, before the onset of ventricular dilation (Figure 3A). Mitochondrial morphology was also abnormal, including overall decreased mitochondrial size (Figure 3—figure supplements 1 and 2) and decreased complexity of mitochondrial cristae (Figure 3—figure supplement 1). Sarcomere disruption in miR-1 null cardiomyocytes. (A) Transmission electron microscopy (TEM) of P0 wild-type or miR-1 double-knockout myocardium. Representative areas of sarcomeric disarray are indicated (*). Distance between Z-lines is indicated with lines. Arrows indicate disrupted Z-line structures. Scale bar, 1 μm. (B) Immunofluorescence of sarcomeric structures in isolated P0 cardiomyocytes with Phalloidin (F-actin cytoskeleton [orange]) and sarcomeric alpha-actinin (green) DAPI (blue) indicates nuclei. Images captured at 40X magnification. (C) Percentage of cardiomyocytes of individual sarcomeric classes observed. N = 3 for miR-1 null mice; N = 2 for miR-1-1−/−:miR-1-2+/− mice; and n = 6 for miR-1 double-heterozygous mice, with a minimum of 50 cells classified per animal. (D) Representative analysis showing percentage of P5 miR-1 null cardiomyocytes of individual sarcomeric classes observed 24 hr after transfection of a miR-1 mimic or control RNA mimic. Roughly 50 cardiomyocytes per condition were evaluated. *p<0.05; **p<0.01; ***p<0.001;****p<0.0001; ns, not significant. Sarcomeric morphology was further analyzed in isolated P0 neonatal cardiomyocytes by immunostaining for the Z-line protein α-Actinin, as well as by Phalloidin staining to visualize the filamentous actin cytoskeleton. Individual cardiomyocytes were classified on a scale from I–V based on their sarcomeric organization, with class-I cells showing highly ordered sarcomeres, and class-V cells having no sarcomeric organization (Figure 3—figure supplement 3). Sarcomeres in miR-1 null cardiomyocytes showed significant disruption when compared to those from miR-1 double-heterozygous littermates. Only 10% of double-knockout cardiomyocytes had highly organized sarcomeres, compared to 45% of miR-1 double-heterozygous cells. The degree of sarcomeric organization correlated with miR-1 dosage as cardiomyocytes lacking three out of four copies of miR-1 showed an intermediate degree of organization (Figure 3C). To determine if reintroduction of miR-1 was sufficient to improve sarcomere organization in cardiomyocytes from post-natal hearts, we transiently transfected a miR-1 RNA mimic into cultured cardiomyocytes isolated from P5 animals. Indeed, adding miR-1 partially rescued this phenotype and enhanced sarcomeric organization in miR-1 double-knockout cardiomyocytes, compared to those treated with a control RNA mimic (Figure 3D). We performed RNA sequencing of late embryonic stage (E18) miR-1 null and wild-type hearts to identify genes that were dysregulated in the absence of miR-1. We selected this time point in order to reveal primary changes in gene expression due to the loss of miR-1 and not those that may arise secondary to heart failure. Given that many direct miRNA targets are upregulated at the protein, but not transcript level, we expected that sequencing analysis of this stage would identify pathways that are dysregulated in the miR-1 knockout, some of which may involve direct miR-1 targets. We utilized the GREAT interface (McLean et al., 2010) to evaluate the enrichment of miRNA targets within the set of genes that were upregulated in the miR-1 null hearts, compared to wild-type controls (Figure 4—figure supplement 1). We found that genes containing miR-1/206 seed sequence complementarity were most significantly enriched in this data set. Genes targeted by miR-495, miR-518a-2, miR-501 and miR-409 were also enriched, though to a lesser degree. Notably, mRNAs with seed sequence complementarity to miR-133a were not enriched, suggesting that the reduction in miR-133a levels did not reach the threshold for significant dysregulation of genes in the miR-1 knockout. We next performed a gene ontology analysis using the GO-Elite interface (Zambon et al., 2012) to determine at a functional level which dysregulated genes may be phenotypically relevant. We found that genes participating in metabolic and mitochondria-related pathways were downregulated in miR-1 knockout, compared to wild-type hearts, consistent with the morphological abnormalities visualized by electron microscopy (Figure 4A). Interestingly, many upregulated genes fell into the ‘regulation of actin cytoskeletal’ pathway (Figure 4B). As the dysregulation of actins and other cytoskeletal genes contribute to cardiomyopathies, in a complementary analysis, we investigated if any of the upregulated cytoskeletal genes were direct miR-1 targets. miRNA targets remain challenging to predict computationally; therefore, we utilized three different target prediction algorithms—Targetscan (www.targetscan.org), PITA (http://genie.weizmann.ac.il/pubs/mir07/mir07_dyn_data.html), and Pictar (http://pictar.mdc-berlin.de/cgi-bin/PicTar_vertebrate.cgi)—to identify consensus predicted targets (Figure 4C, Figure 4—source data 1). Of the genes that were expressed at an equal or higher level in the knockout compared to wild-type hearts, 89 genes were predicted miR-1 targets by all three algorithms. Of these, 13 genes were significantly upregulated at the mRNA level in the miR-1 null hearts. (Figure 4C, Figure 4—source data 1). Pathway analysis of genes dysregulated in E18 miR-1 null hearts. (A) Pathway analysis of genes downregulated in E18 miR-1 null hearts identified via Go-elite and GenMAPP. Pathways related to metabolism are enriched. (B) Pathway analysis of genes upregulated in the miR-1 null hearts identified via Go-elite and GenMAPP. Values represent normalized mean centered log2 of FPKM for each genotype. (C) Venn diagram depicting overlap of miR-1 targets as predicted by three prediction algorithms: Targetscan, PITA and Pictar. The genes analyzed were expressed at a relative quantity of ≥1 in miR-1 null vs wild-type hearts based on their FPKM (upper). Consensus targets predicted by all three algorithms, showing significant upregulation in the miR-1 null vs wild-type hearts are presented as descending log2 fold change in miR-1 null over wild-type hearts (lower). Mylk (MLCK) in red was identified as a regulator of the actin cytoskeleton (B) and a significantly upregulated, predicted miR-1 target (C). dKO, double-knockout; WT, wild-type; FPKM, fragments per kilobase per million. In the miR-1 null animals, myosin light chain kinase (MLCK) was a putative miR-1 target of particular interest, as it was highly upregulated and had a known role in regulating the cytoskeleton (Figure 4B,C). MLCK, which is encoded within the Mylk locus, regulates the cytoskeleton by phosphorylating the regulatory Myosin Light Chain 2 (MLC2). MLC2 is associated with Myosin Heavy Chain (MHC) and is situated adjacent to the actin interaction domain of the globular myosin head. In smooth muscle, MLC2 phosphorylation is sufficient to induce contraction, and in the striated muscle of the heart, phosphorylation increases the rate and magnitude of contractile force (Davis et al., 2001, reviewed in Kamm and Stull (2001)). The 31 exons of the Mylk locus give rise to four distinct but overlapping gene products (Figure 5A). Two 220-kD MLCK isoforms, which vary only by alternate inclusion of exon 1, are expressed in non-muscle cell types, a 130-kD broadly expressed isoform and a 17-kD isoform, called Telokin, which lacks a functional kinase domain but shares an identical carboxy-terminal domain, and is specifically expressed in smooth, but not cardiac, muscle. The transcription of each isoform is regulated by individual promoters, which direct their spatially and temporally restricted expression (Herring et al., 2006). When the 3′ UTR region of Mlck/Telokin containing the predicted miR-1 binding site was cloned downstream of a luciferase reporter, luciferase activity was repressed in the presence of a miR-1 mimic. The repression was alleviated when the target site was deleted, validating this 3’ UTR of Mlck/Telokin as a direct miR-1 target (Figure 5B). 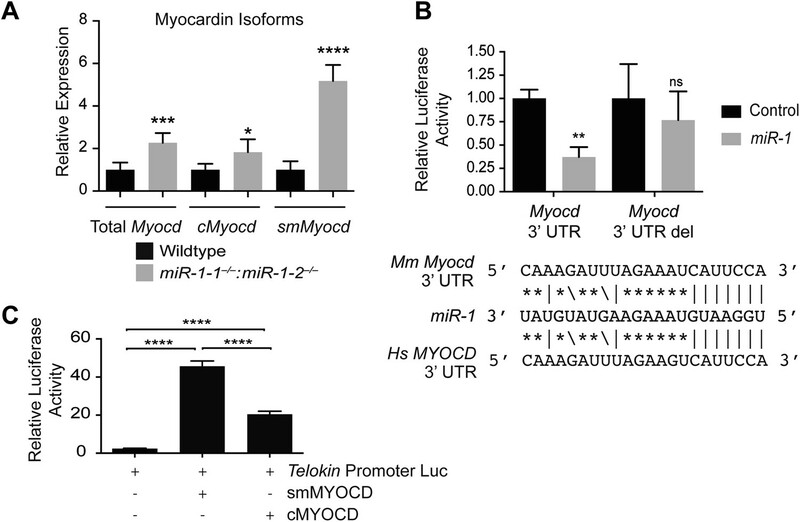 Dysregulation of Telokin and Myosin light chain phosphorylation in miR-1 null hearts. (A) Diagram of the gene products encoded within the Mylk locus. Independent promoters preceding exons are indicated by arrows. Exon-spanning qPCR primers used are indicated in red (Mlck/Telokin) or blue (Mlck). (B) Luciferase activity of a reporter construct containing ∼200 bp of the Mlck/Telokin 3′-UTR surrounding the predicted miR-1 binding site with or without the site deleted. The constructs were co-transfected into H9C2 myoblasts with a miR-1 mimic or a control mimic. Sequence of the putative miR-1 target site as predicted by Targetscan and site conservation between human (Hs) and mouse (Mm) is indicated. (C) Western blot of heart lysates (top) and qPCR of RNA (bottom) from P0 wild-type or miR-1 null mice. (N = 5 per group). (D) Model of Telokin function in smooth muscle to promote the activity of myosin light chain phosphatase and inhibit the activity of the myosin light chain kinase. (E) Western blot of total myosin light chain 2 (MLC2) and phosphorylated myosin light chain (p-MLC2) in P0 wild-type or miR-1 null hearts; GAPDH serves as loading control. (F) qPCR of the Telokin promoter sequence or an intergenic genomic sequence following chromatin immunoprecipitation (ChIP) of RNA polymerase II in P2 wild-type or miR-1 null hearts. For the Telokin promoter, two non-overlapping probe sets were used, indicated as Telokin promoter A and B. To determine which isoforms were upregulated in miR-1 double-knockout hearts, we examined the protein expression profiles of the various isoforms in wild-type and miR-1 double-knockout hearts by western blot (Figure 5C). The non-muscle 210-kD isoform was undetectable, and the expression of the 130-kD MLCK isoform was not significantly altered in miR-1 double-knockout hearts. Telokin protein, as previously reported (Herring et al., 2001), was not detectable in wild-type hearts, but was highly expressed in hearts of miR-1 double-knockouts. qPCR confirmed the normally smooth muscle-restricted Telokin was aberrantly expressed in miR-1 null myocardium (Figure 5C). Notably, while smooth muscle gene expression is reported to be dysregulated in miR-133a-1:miR-133a-2 double-knockout hearts (Liu et al., 2008), we found that Telokin expression was not upregulated in those animals (Figure 5—figure supplement 1), suggesting that the misexpression was specifically due to the loss of miR-1. Despite lacking a catalytic kinase domain, Telokin plays an important role in the regulation of MLC phosphorylation in smooth muscle by inhibiting MLCK and promoting activity of the MLC phosphatase (Choudhury et al., 2004; Khromov et al., 2012) (Figure 5D). Consistent with aberrant Telokin expression in cardiomyocytes, MLC phosphorylation was dramatically decreased in miR-1 double-knockout hearts, likely contributing to the observed cardiac dysfunction (Figure 5E). While direct repression by miR-1 may help to inhibit cardiac translation and stability of Telokin transcripts, it was unclear how loss of miR-1 resulted in the preferential upregulation of Telokin and not the full-length Mlck, which is thought to share a common 3′ UTR. To determine if the Telokin promoter was aberrantly active in miR-1 double-knockout hearts, we performed RNA Pol II chromatin immunoprecipitation and assayed for occupancy at the Telokin promoter. In wild-type hearts, Pol II occupancy at the Telokin promoter was equivalent to that of an untranscribed intergenic region, in agreement with Telokin’s published smooth muscle-restricted expression pattern (Herring et al., 2001) (Figure 5F). In contrast, Pol II actively bound the Telokin promoter in miR-1 double-knockout hearts (Figure 5F). These data indicate that miR-1 normally acts to repress Telokin expression in the heart by both directly targeting the Telokin 3′ UTR and by negatively regulating Telokin transcription. To gain mechanistic insight into how miR-1 may be negatively regulating Telokin transcription and to identify, at a more general level, transcriptional networks perturbed in the absence of miR-1, we again utilized the GREAT interface (McLean et al., 2010) to identify known transcription factor motifs within the Msig database that were enriched within regulatory elements of the genes dysregulated in the double-knockouts. Interestingly, a disproportionate number of the genes upregulated in miR-1 double-knockout hearts contained CArG boxes (CC/ATn/GG), a motif bound by SRF (Treisman, 1986) (Figure 6A, Figure 6—figure supplement 1). SRF is a critical regulator of the cardiac and smooth muscle transcriptome and regulates sarcomere formation in cardiomyocytes (Li et al., 1997, 2003; Wang et al., 2001; Niu et al., 2007; Hoofnagle et al., 2011). SRF is also a highly conserved direct upstream regulator of the miR-1/133a transcript (Kwon et al., 2005; Zhao et al., 2005) and is itself a target of miR-133a, being upregulated in the hearts of miR-133a-1:miR-133a-2 double-knockout animals (Chen et al., 2005; Liu et al., 2008). However, SRF was not dysregulated at the RNA or protein level in miR-1 double-knockout hearts (Figure 6B). This finding suggests that a simple increase in SRF expression is not responsible for the upregulation of SRF target genes and, furthermore, that the level of miR-133a expressed in miR-1 double-knockouts is sufficient to maintain normal SRF expression levels. Upregulation of SRF targets in miR-1 null hearts. (A) Promoter motif enrichment in genes upregulated in miR-1 double-knockout hearts. Motif sequences and transcriptional regulators are indicated (left) with the log10 of the hypergeometric p value graphed. Multiple CArG box sequences, the motif bound by SRF, were identified (red). (B) Western blot (top), and qPCR (bottom) for Srf expression in post-natal miR-1 null or wild-type hearts. (C) Myocardin dependent and independent SRF target gene expression in postnatal miR-1 null or wild-type hearts by qPCR (left). Western blots of selected Myocardin-dependent SRF target genes (right). Tagln, Transgelin/Sm22; Csrp1,2, Cysteine And Glycine-Rich Protein 1,2; Cnn1,2, Calponin1,2; Acta2, smooth muscle alpha actin; miR-145, microRNA-145; Fos, FBJ Murine Osteosarcoma Viral Oncogene Homolog; Egr1, Early growth response 1. *p<0.05; **p<0.01; ***p<0.001;****p<0.0001; ns, not significant. One mechanism by which the specificity of SRF targets is conferred is through the expression and activity of tissue-specific cofactors. Myocardin (MYOCD), which is expressed predominantly in cardiac and smooth muscle (Wang et al., 2001), is one such cofactor. MYOCD is necessary and sufficient for smooth muscle differentiation in vitro and in vivo (Li et al., 2003; Chen et al., 2002; Wang et al., 2003) and is necessary for the differentiation and maintenance of ventricular cardiomyocytes (Wang et al., 2001; Hoofnagle et al., 2011). Among the SRF target genes that were dysregulated in the miR-1 double-knockouts, many, including Telokin, were known targets of the MYOCD/SRF complex (Figure 6C, Figure 6—figure supplement 1), while MYOCD independent SRF target genes, such as Fos and Egr1, were not upregulated (Figure 6C). Notably, the expression of numerous other known SRF co-factors, including NKX2-5, MRTF-A, BRG1, GATA4 and GATA6 were unchanged (Figure 6—figure supplement 2). These findings suggest that MYOCD/SRF dependent gene expression is specifically upregulated in the miR-1 knockout hearts. Using qPCR to compare the expression of Myocd in miR-1 double-knockout hearts and controls, we found that the expression of this critical transcription factor was increased roughly twofold upon deletion of miR-1 (Figure 7A). Using Targetscan, we identified a potential miR-1 binding site in the Myocd 3′-UTR and demonstrated, using a luciferase assay, that miR-1 directly targets the Myocd 3′ UTR (Figure 7B). Previous studies have shown that the Telokin promoter is more responsive to MYOCD than the full-length 130-kD Mlck promoter (Herring et al., 2006). Thus, as we observed, an increase in MYOCD expression would be predicted to preferentially upregulate the transcription of the Telokin isoform, while only modestly increasing transcription of the full-length transcript. miR-1 regulates the SRF co-factor, Myocardin. (A) qPCR for Myocardin (Myocd) expression. Probe sets are specific for inclusion of exon 2a for smooth muscle Myocd (smMyocd), exclusion of exon 2a for cardiac Myocd (cMyocd), or for downstream exons common to both transcripts (Total Myocd). P0 hearts were analyzed, N = 5 per genotype. (B) Luciferase activity of a reporter construct containing the miR-1 putative target site derived from the Myocd 3′ UTR or a deleted site. The constructs were co-transfected into H9C2 myoblasts with either a miR-1 mimic or a control mimic. The sequence of the putative miR-1 target site as predicted by Targetscan and site conservation between human (Hs) and mouse (Mm) is indicated. (C) The expression of luciferase driven by the Telokin+370 promoter when transfected into Cos cells, alone or with either full-length smMyocd or cMyocd. *p<0.05; **p<0.01; ***p<0.001;****p<0.0001; ns, not significant. There are two distinct Myocd isoforms, the full-length cardiac isoform (cMYOCD) and the truncated smooth muscle isoform (smMYOCD) (Creemers et al., 2006). smMyocd is produced by alternate splicing and inclusion of exon2a, which encodes a translational stop and necessitates the use of an alternate downstream start site. This splicing event results in a truncated protein, lacking the N-terminal–MEF2 interaction domain of the full-length cMYOCD. Although the functional significance of these two isoforms is not well understood, the promoters of some smooth muscle-restricted genes, such as Tagln (Sm22), are more sensitive to smMYOCD than cMYOCD, while some cardiac promoters, such as Myh6 (α-Mhc), are more responsive to cMYOCD (Imamura et al., 2010). Normally, smMyocd expression is relatively low in the neonatal heart; however, we discovered using qPCR that in miR-1 double-knockout hearts the expression of smMyocd was fivefold higher than control hearts, while cMyocd was upregulated roughly 1.8-fold (Figure 7A). More specific upregulation of smMyocd was not evident with statistical confidence in our RNA-seq data likely due to insufficient sequencing depth to detect the small 44 bp exon 2a inclusion within the relatively low overall abundance of smMyocd transcript. While cMyocd still represents the predominant isoform in miR-1 double-knockout hearts (data not shown), subtle changes in transcription factor expression can result in dramatic changes in gene expression. Using a luciferase reporter cloned downstream of the mouse Telokin promoter, we found that smMYOCD was twice as effective as cMYOCD at activating the Telokin promoter (Figure 7C). More broadly, we found that many of the MYOCD-dependent genes upregulated in the miR-1 knockouts were smooth muscle genes (Figure 6—figure supplement 1). Smooth muscle gene upregulation was also reported in the myocardium of miR-133a knockout mice, due in part to the upregulation of SRF. Neither total Myocd nor smMyocd, however, was upregulated in the myocardium of miR-133a double-knockouts, indicating that the miR-133a levels do not affect Myocd expression (Figure 5—figure supplement 1). 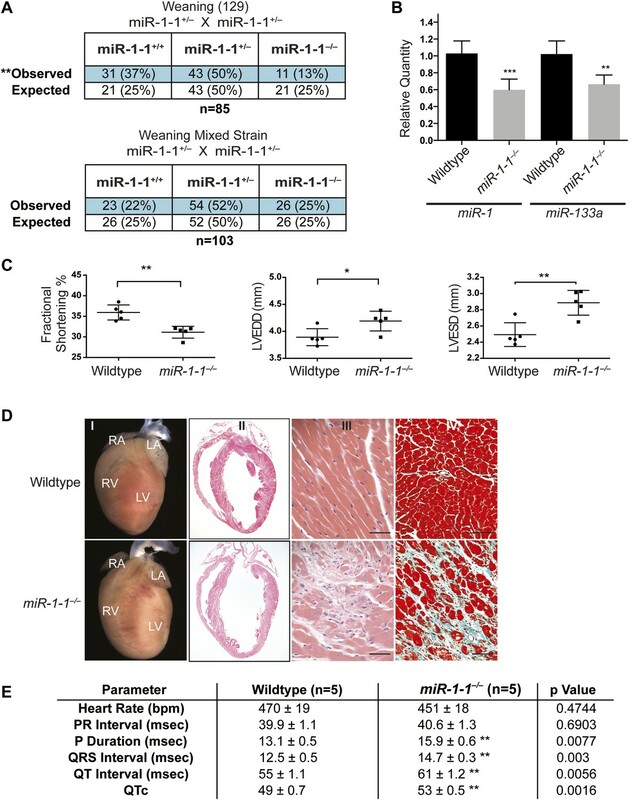 These data suggest a model whereby miR-1 and miR-133a cooperate to repress smooth muscle gene transcription in the heart by repressing smMyocd and Srf, respectively, thereby reinforcing the striated muscle phenotype (Figure 8B). 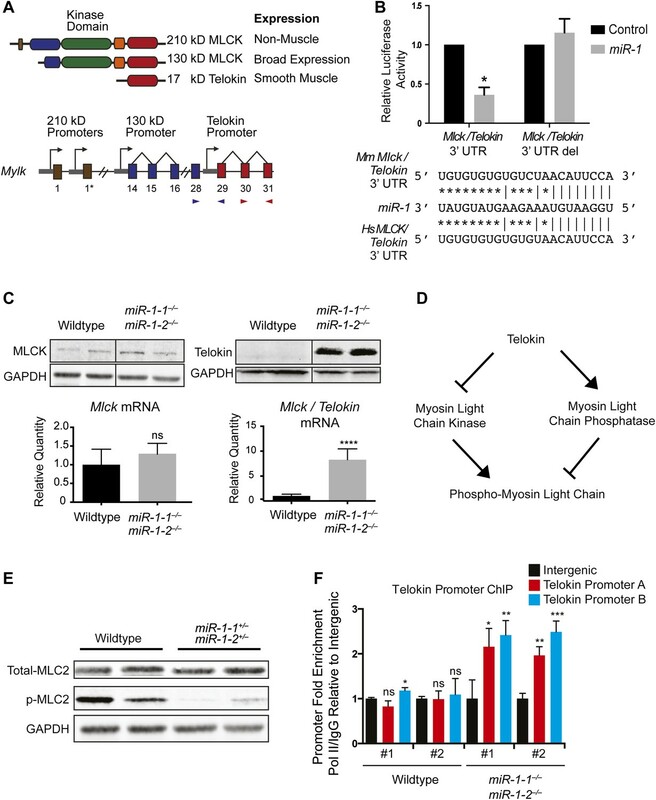 miR-1 regulation of Myosin light chain phosphorylation and smooth muscle gene expression. (A) Dual regulatory model by which miR-1 acts to normally repress Telokin expression in the heart by directly targeting its 3′ UTR and its upstream transcriptional regulator, smooth muscle myocarding (smMYOCD). MLCK, myosin light chain kinase; MLCP, myosin light chain phosphatase; MLC, myosin light chain; MHC, myosin heavy chain; P, phosphorylation. (B) Regulatory model by which the miR-1/133a cluster cooperates to suppress smooth muscle gene expression in the heart. The results of this study reveal the essential, multi-faceted role that miR-1 plays in the mammalian heart. The uniform lethality of miR-1 double-knockout animals, associated with dilated cardiomyopathy and abnormal heart rhythm, indicates that miR-1 is required for normal cardiac contractility. At a cellular level, we found that sarcomere disruption is one feature that underlies the impaired cardiac function, and reintroduction of miR-1 into ex vivo cardiomyocytes was sufficient to partially rescue this phenotype. miR-1 functions to negatively regulate the smooth muscle-specific inhibitor of MLC phosphorylation, Telokin. Aberrant upregulation of Telokin and the resulting decrease in phosphorylated MLC in miR-1 null hearts may contribute, in part, to the sarcomeric contractility defect. miR-1 regulation of Telokin is accomplished by direct targeting of its 3′ UTR, as well as through targeting of its transcriptional regulator, Myocd. In particular, miR-1 preferentially regulates smMyocd, thereby complementing the effects of miR-133 to suppress the smooth muscle gene program (Figure 8). In ex vivo cardiomyocytes, restoring miR-1 expression alone was sufficient to partially rescue the sarcomeric defects of miR-1 double-knockout hearts, demonstrating that the loss of miR-1 plays a causative role in this phenotype, but not ruling out a contribution from decreased miR-133a expression. In this and previous studies (Mishima et al., 2009), genes related to the actin cytoskeleton are highly responsive to alterations in miR-1 expression. MLC phosphorylation is critical for sarcomere assembly and regulating the speed and force of contraction in the heart (Aoki et al., 2000; Davis et al., 2001). In mammals, there are multiple MLC2 isoforms, but deletion of the single cardiac zebrafish isoform results in a lack of thick filament assembly (Rottbauer et al., 2006). At a molecular level, phosphorylation of MLC2 results in a conformational shift in the associated MHC, bringing it into closer proximity to the thin filament and increasing the probability of cross-bridge formation. Not surprisingly, in humans, MLC2 mutations are associated with myopathies (Poetter et al., 1996; Davis et al., 2001). Thus, decreased phosphorylation of MLC in the absence of miR-1 likely plays a role in the sarcomeric disruption and cardiac dysfunction in miR-1 double-knockouts. We found that one mechanism by which miR-1 normally acts to maintain p-MLC in the heart is through the repression of the usually smooth muscle-restricted protein Telokin. Telokin expression in smooth muscle is thought to maintain cells in a less contractile state, and it is interesting that the heart employs miR-1 to ensure the absence of Telokin through both transcriptional and post-transcriptional mechanisms (Figure 8A). Although it is not possible to distinguish the contribution of transcriptional regulation of Telokin vs direct miR-1 targeting of the Telokin 3′ UTR, the dramatic degree of Telokin protein upregulation compared to the more moderate Telokin mRNA increase is consistent with some degree of translational control by miR-1 (Figure 4C). How Telokin misexpression affects cardiac function has not been directly evaluated; however, ectopic expression in the myocardium has been reported in a doxorubicin induced rat model of cardiomyopathy, although the precise mechanism by which Telokin contributes to this pathology is unknown (Dudnakova et al., 2003). While the focus of this study was to explore the function of miR-1 in the heart, miR-1 likely plays a more subtle role in the skeletal muscle. It is worth noting that electron microscopy of P0 miR-1-null skeletal muscle showed the presence of ordered sarcomeric structures (data not shown) and neonatal mice were mobile. While we cannot rule out a more subtle skeletal muscle phenotype due to the early lethality, it is possible that the skeletal muscle specific miR-1 family member, miR-206, can compensate for the loss of miR-1 in this tissue. A clear understanding of the role that the miR-1 family plays in the context of skeletal muscle will require the generation a skeletal muscle-specific compound deletion of miR-1-1, miR-1-2 and miR-206. The marked downregulation of miR-133a in the miR-1 double-knockouts is a critical consideration with respect to the interpretation of some of the phenotypes that we observed. While targeted disruption of miR-1 might adversely affect transcriptional read-through of the miR-1-1/miR-133a-2 locus, secondary downregulation of miR-133a expression from regulatory feedback mechanisms also appears to occur (Figure 2—figure supplement 10). miR-1 and miR-133a are dramatically upregulated during the differentiation of cardiac and skeletal muscle (Chen et al., 2005; Ivey et al., 2008). While the current study shows definitively that miR-1 is not required for initial cardiomyocyte differentiation in vivo, the loss of miR-1 expression may impair further cardiomyocyte differentiation and/or maturation. This would predictably result in decreased developmental upregulation of the miR-1/133 loci. Consistent with this model, the loosely organized sarcomeric morphology and the abnormal mitochondrial morphology we observed by TEM are similar to those of more immature cardiomyocytes (Hom et al., 2011). 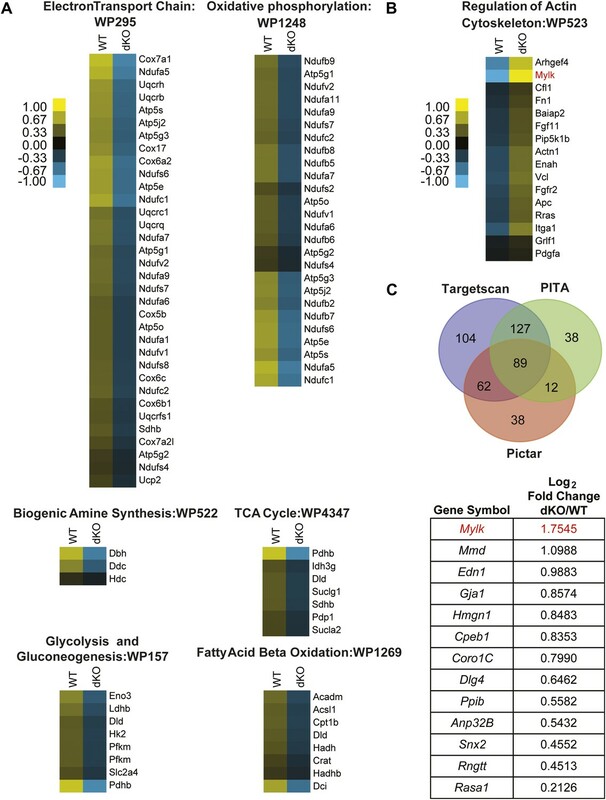 The upregulation of members of the cardiac fetal gene expression program, such as Nppa (Figure 6—figure supplement 1), and even the upregulation of smooth muscle genes, which are normally expressed in embryonic cardiomyocytes, supports this paradigm. As such, the expression of miR-133a, a key developmentally regulated miRNA, may be secondarily downregulated in miR-1 double-knockout mice as a result of a subtle cardiac differentiation or maturation defect, although the exact mechanism is unknown. The power of miRNAs to affect biological processes is amplified by the ability of a single miRNA to regulate multiple nodes within a genetic network. Srf is a direct target of miR-133a, and its expression, as well as that of many smooth muscle target genes, is upregulated in the hearts of miR-133a-knockout animals (Chen et al., 2005; Liu et al., 2008). We found that SRF mRNA and protein expression in miR-1 double-knockout hearts was unaffected, despite the partial downregulation of miR-133a. Nevertheless, some of the smooth muscle genes upregulated in miR-133a double-knockout hearts were also upregulated in the miR-1 double-knockout animals (Acta2, Cald1, Csrp2, Cnn1, Tagln), while others, including Telokin, cMyocd and smMyocd, were uniquely upregulated in the miR-1 double-knockouts. 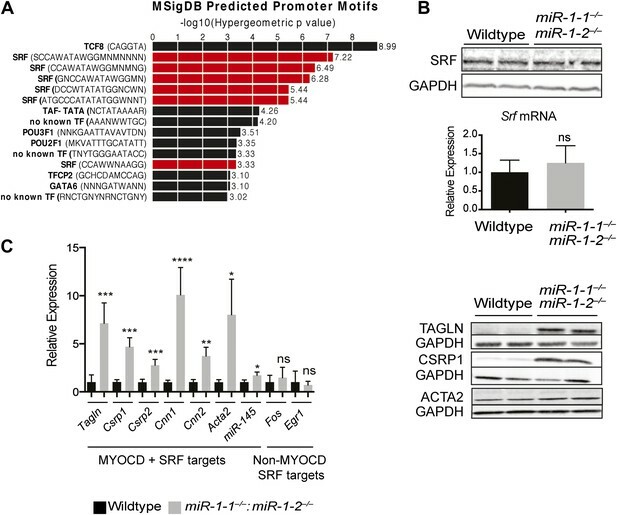 Our data suggest that miR-1 and miR-133a, transcribed together from bicistronic miRNA clusters, cooperate to repress SRF-dependent smooth muscle gene expression in the heart by independently regulating SRF or its co-factor, MYOCD, respectively (Figure 8B). We also found that the Telokin promoter is preferentially responsive to the smMYOCD isoform, upregulated in the absence of miR-1. This is consistent with the observation that, while both MYOCD isoforms share an identical SRF-interacting domain, they are not functionally equivalent with respect to mediating the transcription of SRF target genes (Creemers et al., 2006; Imamura et al., 2010). While yet to be carefully evaluated, cMyocd and smMyocd are thought to share a common 3′ UTR; thus, it is unlikely that direct targeting by miR-1 alone is responsible for the observed isoform switch. The splice factor(s) that regulate the inclusion or exclusion of the 2a exon in the smooth muscle or heart, respectively, are unknown. Therefore, a potential mechanism by which miR-1 may regulate Myocd splicing is through the direct repression of a splice factor that normally mediates alternate inclusion of the 2a exon in smooth muscle. Further studies will be required to elucidate the mechanism by which miR-1 regulates this critical transcription factor and ultimately smooth muscle gene expression. The miR-1-1 targeting vector was generated by flanking 5′ and 3′ genomic DNA around a floxed neomycin resistance gene (Neo) driven by a pGK promoter. Targeting of the miR-1-1 locus was accomplished through homologous recombination in E14 ES cells and resulted in replacement of the genomic sequence containing the pre-miR-1-1 (∼280 bp) by the Neo gene. 672 colonies were screened, and three targeted clones were identified. miR-1-1 heterozygous embryonic stem cells were injected into D3.5 BL6 blastocysts. For the establishment of the miR-1-1-targeted allele on a 129 background, chimeric males were mated to wild-type 129 (Jackson Lab) females. To generate compound miR-1 knockouts, miR-1-1-targeted animals were crossed to a previously described miR-1-2 targeted mouse maintained on a mixed (129/BL6) background. Animals double heterozygous for both miR-1 alleles (miR-1-1+/−:miR-1-2+/−) were subsequently intercrossed to generate animals lacking three out of four alleles of miR-1 (miR-1-1−/−:miR-1-2+/− or miR-1-1+/−:miR-1-2−/−). These animals were subsequently intercrossed to generate compound miR-1 knockout animals (miR-1-1−/−:miR-1-2−/−). Genotyping was performed by PCR [Supplementary file 1] with primers that specifically recognized the wild-type or targeted miR-1-1 or miR-1-2 alleles. The animals were sacrificed by decapitation for neonates or by CO2, followed by cervical dislocation for adult animals. All animal care and experimental protocols were reviewed and approved by the Institutional Animal Care and Use Committee of the University of California, San Francisco (UCSF). For electron microscopy, tissue was fixed in 2% glutaraldehyde, 1% paraformaldehyde in 0.1 M sodium cacodylate buffer pH 7.4, post fixed in 2% osmium tetroxide in the same buffer, en block stained in 2% aqueous uranyl acetate, dehydrated in acetone, infiltrated, and embedded in LX-112 resin (Ladd Research Industries, Williston, VT). Toluidine blue stained semi-thin sections were made to locate the areas of interest. The samples were ultrathin sectioned on a Reichert Ultracut S ultramicrotome and counter stained with 0.8% lead citrate. Grids were examined on a JEOL JEM-1230 transmission electron microscope (JEOL USA, Inc., Pleasanton, CA) and photographed with the Gatan Ultrascan 1000 digital camera (Gatan Inc., Pleasanton, CA). Adult mouse echocardiography was performed under anesthesia as described (Qian et al., 2011). Electrocardiograms were performed as described (Zhao et al., 2007). Neonatal studies were performed as described above without anesthesia. Tissue was collected at indicated times and fixed using 10% formalin overnight at 4°C and stored subsequently in 70% ethanol. Paraffin embedding and staining was performed using standard histological techniques. Sarcomeric staining was performed using anti-sarcomeric alpha-actinin (1:400; Sigma, St. Louis, MO) and rhodamine conjugated Phalloidin (Clontech, Mountain View, CA). Hearts were isolated from P0 animals and rinsed several times in 1X HBSS with Pen-Strep. The great vessels and atrium were removed and discarded, and the ventricles were minced manually with scissors and further disassociated enzymatically with collagenase digestion. 1 mg/ml collagenase II was added to the minced ventricles and briefly incubated at 37°C for 3–5 min with agitation. The digests were allowed to settle without agitation briefly (3 min) before the supernatant of this initial digestion (mostly blood cells) was discarded and another digestion was performed for 15–20 min. The supernatant of this subsequent digestion (cardiomyocytes) was added to 3X volume of FBS, and centrifuged for 5 min at 300 × g in a tabletop centrifuge. The resulting cell pellet was resuspended in DMEM/F12 medium with 10% FBS and Pen-Strep and passed through a 70-μM filter before plating on 1% gelatin with fibronectin. Cardiomyocytes for sarcomeric analysis were fixed and stained 24 hr post-plating. The cardiomyocytes used for sarcomeric rescue studies were transfected with miR-1 mimic or control (Ambion/Life Technologies, Carlsbad, CA) roughly 12 hr post-plating with Lipofectamine 2000 (Life Technologies) and maintained in serum-containing medium. The cells were fixed for analysis 24 hr post-transfection. Roughly 200 bp surrounding the predicted miR-1 target sites in the Mlck/Telokin or Myocd 3′ UTR were amplified directly from cDNA generated from miR-1 double-knockout hearts with the primers listed (Supplementary file 1) and subcloned into the PGL3 (Promega, Madison, WI) firefly luciferase vector 3′ of the reporter gene with XbaI. Luciferase constructs were transfected along with a Renilla normalization vector into the H9C2 rat myoblast cell line with Lipofectamine 2000 (Life Technologies), according to manufacturer’s instructions. Briefly, 12-well plates were transfected at roughly 60% confluency and analyzed 20 hr later. Each well received 3 μl of Lipofectamine 2000, 800 ng of PGL3-Target, and 200 ng of Renilla vector. Experimental wells received 10 pmols of miR-1 mimic (Ambion/Life Technologies), while control wells received 10 pmols of a non-targeting control mimic (Ambion/Life Technologies). Promoter activity assays were performed with the Telokin+370 promoter (a gift from Dr Paul Herring, Indiana University). cMyocd and smMyocd constructs were as described in Wang and Olson (2004) Cordes et al., (2009). Promoter constructs (500 ng), Myocd (250 ng) or control LacZ expression plasmid and 50 ng of Renilla were transfected into Cos cells with Lipofectamine 2000 at 50% confluency. Luciferase intensity was analyzed 20 hr post-transfection. Firefly and Renilla luciferase activities were quantified in lysates with the Dual Luciferase Reporter Assay kit (Promega) on a Victor 1420 Multilabel Counter (PerkinElmer, Madison, WI). Firefly luciferase values were normalized to Renilla to control for transfection efficiency. RNA was isolated with TRIzol reagent according to the manufacturer’s protocol. Quantitative real-time PCR for microRNAs was performed with the TaqMan miRNA assay kit (Applied Biosystems/Life), and TaqMan probes for miR-1 (Applied Biosystems/LIfe), miR-133a (Applied Biosystems/Life) were used according to the manufacturer’s protocols. cDNA for mRNA quantification was generated using Superscript with oligodT and random hexamers (Invitrogen). Detection of splice variants for Myocd was performed using oligo dT generated cDNA (Invitrogen/Life). qPCR probes for the Telokin promoter, and Myocd splice variants were designed using Primerquest software and synthesized by Integrated DNA Technology (IDT, San Jose, CA). Intergenic region primers were designed based on sequence published previously. The probe sequences and part numbers are listed in Supplementary file 1. Expression values were normalized to the expression of U6 (Applied Biosystems/Life) for miRNA analysis or Gapdh (Applied Biosystems/Life) for mRNA quantification, and fold change was determined using the ΔΔCT method with SDS RQ Manager software (Applied Biosystems/Life). Whole hearts from E18 wild-type and miR-1 double-knockout animals were isolated and total RNA was extracted with TRIzol (Invitrogen/Life), following the manufacturer’s suggested protocol. Genomic DNA was removed using a gDNA eliminator column (Qiagen, Hilden, Germany). RNA from three hearts of each genotype was pooled, and library preparation and sequencing were performed by the Beijing Genomics Institute (BGI). In brief, polyA transcripts were enriched and paired-end reads were sequenced on a High-seq 2000 (Illumina, San Diego, CA). Reads were mapped to the mm 9 genome, Ensembl v 59 annotation, with TopHat2 (Kim et al., 2013). Rank expectation (Thomas et al., 2011) was used to identify genes that were differentially expressed between the two backgrounds, using a false discovery rate threshold of 0.1. Neonatal hearts (P2) from wildtype, miR-1-1 null and miR-1-2+/−:miR-1-1+/− double heterozygote animals were isolated and total RNA was extracted with TRIzol (Invitrogen/Life), following the manufacturer’s suggested protocol. Genomic DNA was removed using a gDNA Eliminator column (Qiagen). The samples were hybridized to Affymetrix Mouse Genechip ST 2.0 arrays. All arrays were RMA normalized and differentially expressed genes were identified using Limma. Gene changes were compared to an existing data set (Zhao et al., 2007) for miR-1-2 null animals. 822 genes were statistically changed in one of the three genotypes when compared to the wild-type control (p value of 0.0025 and a fold change of greater than 1.5 or less than 0.5). Of these differentially expressed genes, 201 genes could be evaluated across all genotypes due to the difference in array probe sets. Hearts were isolated from animals of the indicated genotypes between P0 and P3 and rinsed with 1X PBS. The tissue was resuspended in RIPA buffer and disassociated in a Bullet Blender (Next Advance). After a clarification and sonication step, the lysates were loaded on to a 4–20% SDS-PAGE (Biorad, Hercules, CA) gel and blotted using standard protocols. Primary antibodies against GAPDH (1:1000; Abcam), SRF (1:200; Santa Cruz Bio., Dallas, TX), CSRP1 (1:500; Abcam), TAGLN/Sm22 (1:500; Abcam), p-MLC ser18/thr19 (1:1000; Cell Signaling), MLCK/Telokin (1:1000; Abcam, Cambridge, England), ACTA2 (1:2000; Sigma). Visualization and quantification of blots was done on a Licor Odyssey system with fluorescently conjugated secondary antibodies (Licor, Lincoln, NE), according to manufacturer’s instructions. Pol II ChIP was performed as in Lee et al. (2006) with minor modifications. qPCR primer sequences described in Supplementary file 1. Data were analyzed with Prism and/or Excel and an unpaired t test was used to determine statistical significance. Predicted genotype ratios were calculated by chi-square analysis. Relative quantity for qPCR analysis was determined using ΔΔCT method. Values for experimental animals normalized to the average of controls. J Mol Cell Cardiol 34:1345–1356. J Muscle Res Cell Motil 25:657–665. Am J Physiol Cell Physiol 291:C817–C827. Am J Physiol Cell Physiol 280:C12–C21. Am J Physiol Heart Circ Physiol 300:H1707–H1721. Proc Natl Acad Sci USA 102:18986–18991. Proc Natl Acad Sci USA 100:9366–9370. Proc Natl Acad Sci USA 104:20844–20849. Proc Natl Acad Sci USA 105:17824–17829. Curr Opin Cell Biol 19:618–627. Proc Natl Acad Sci USA 103:8721–8726. Curr Opin Genet Dev 14:558–566. Proc Natl Acad Sci USA 100:7129–7134. Thank you for sending your work entitled “microRNA-1 regulates sarcomere formation and suppresses smooth muscle gene expression in the mammalian heart” for consideration at eLife. Your article has been favorably evaluated by a Senior editor, a Reviewing editor, and 3 reviewers. This manuscript describes the effect of compound deletion of miR-1-1 and miR-1-2. The authors had previously published on the phenotype of miR-1-2 deletion and they now show the phenotype of miR-1-1 and double miR-1-1/2 mutants. Complete deletion of miR-1 results in death and cardiac dysfunction. The authors have uncovered an interesting mechanism to explain the phenotype. They show that miR-1-null cardiomyocytes have abnormal sarcomere organization and decreased phosphorylation of the regulatory myosin light chain-2 (MLC2). The smooth muscle restricted inhibitor of MLC2 phosphorylation, Telokin, is ectopically expressed in the myocardium, along with other smooth-muscle genes. The authors determine that the mechanism underlying miR-1 repression of Telokin expression is both by direct targeting via seed sites in the 3' UTR and also by repressing the transcriptional regulator, Myocardin. These data therefore imply that miR-1 functions to regulate the maintenance of the striated muscle phenotype in cardiomyocytes. This is an interesting study. However the following points need to be addressed before publication. 1) The authors claim that miR-1-1 knockout mice have a comparable phenotype to the miR-1-2 knockout animals and that deletion of one of the isoforms is responsible for roughly half the total amount of miR-1 present in the heart. What are the targets that are responsible for the phenotype in the miR-1-1 knockout mice and do they overlap with the targets that the authors previously identified to be responsible for the miR-1-2 knockout phenotype? Are the miR-1 targets described in Figure 4 also regulated in either the miR-1-1 or miR-1-2 knockout mice? 2) What are the differences between the miR-1-2 het/miR-1-1 het and the phenotype of either the miR-1-1 or 1-2 homozygous null? 3) miR-133a is also reduced in the miR-1-1 KO based on Figure 1B. How much of the double miR-1 mutant phenotype is due to loss of miR-133? This question is considered indirectly in a few instances but not really adequately addressed. The authors have RNA sequence data that they can use to predict miR-1 (as shown in Figure 4) and miR-133 target genes. If, as the authors suggest, reduced miR-133a is only a minor part of the phenotype they observe then there should not be an enrichment in the upregulated genes for miR-133a seed sites. If miR-133a regulated genes are also important for the phenotype then this can be further validated and incorporated into the story. 4) If Myocardin is upregulated in the miR-1 knockout mice, would one not expect to see an increase in miR-133 instead of a decrease? 5) Myocardin upregulation seen on the RNAseq dataset should show the different isoforms. If so this should be included in the paper and if not then this should be explained/discussed. 6) Regarding the RNAseq dataset please comment on why there are equal numbers of up and down regulated genes – perhaps the stage that was analyzed is too late since there would be predicted to be more genes upregulated. 7) Due to the artificial nature of luciferase experiments, one could envision that Telokin is solely regulated by miR-1 at the transcriptional level. Can the authors comment on this? 8) In general, the phenotypic analysis is strong. The authors may consider showing some of the ECG data with different types of atrial arrhythmias. 9) The Results section can be written more concisely with part of the text moved to the Discussion. 10) Did the authors check to see whether there is a phenotype in the skeletal muscles of the compound miR-1 knockout mice? This is not essential for this paper, but a mention in the Discussion would be interesting. The most prevalent phenotype in both the miR-1-1 and miR-1-2 knockout animals was a cardiac conduction abnormality, which was at least partially ascribed to dysregulation of the miR-1 target, Irx5, in the miR-1-2 knockout. We also found that Irx5 was dysregulated in the miR-1-1 knockout and present that data as Figure 1–figure supplement 6. The other miR-1 target that may have contributed to the miR-1-2 phenotype was Hand2, which was not dysregulated at the mRNA level in the miR-1-1 knockout. More broadly, we observed similar shifts in gene expression between the miR-1-1 and miR-1-2 knockout mice (see number 2 below, Figure 2–figure supplement 2), some of which may represent direct targets. Most of the putative miR-1 targets described in Figure 4C dysregulated in the miR-1 double knockout mice were not significantly altered in the single knockouts. Since the purpose of this study was to assess the effect of compete loss of miR-1, we intentionally presented a limited phenotypic analysis of the miR-1-1 knockout mice and then proceeded to use them as a tool to generate miR-1-null animals. Nevertheless, to address this question, we performed gene expression analyses to compare the miR-1-1 and miR-1-2 knockouts to the double heterozygotes. We have included these results as Figure 2–figure supplement 2. In summary, we find that gene expression changes of each single knockout were quite similar though not identical to that of the double heterozygotes. Thank you for this suggestion, which we agree is a very important one. To address this comment, we utilized the GREAT interface to evaluate the enrichment of putative miRNA targets within the set of genes that were upregulated in the miR-1-null hearts compared to wild-type controls. We found that genes containing miR-1/206 seed sequence complementarity were most significantly enriched in this dataset. Genes targeted by miR-495, miR-518a-2, miR-501 and miR-409 were also enriched, though to a lesser degree. Notably, miR-133a predicted targets were not found to be upregulated in the miR-1 null hearts, providing confidence that reduced miR-133a is only a minor part of the phenotype and may not reach the threshold for functional significance. These data have been added to the Results and are presented as Figure 4–figure supplement 1. If Myocardin were the only determinant of miR-133 expression, then we would indeed expect to see an increase in miR-133 in the miR-1 knockout mice. However, transcriptional regulation of the miR-1/133 loci are coordinately regulated by several transcription factors including Myocd, SRF, Mef2, Myod, MyoG and Nkx2-5. Additionally, our data show that the increase in Myocardin expression in miR-1 knockout mice is primarily due to aberrant expression of the smooth muscle Myocardin isoform; thus we would not necessarily expect to see upregulation of transcription of any one striated muscle-enriched Myocardin target. The smooth muscle isoform of Myocardin is distinguished by inclusion of Exon 2A, which is comprised of only 44 nucleotides. This fact alone makes the difference difficult to observe in an RNAseq dataset. Additionally, as a transcription factor, Myocardin is expressed at very low levels and the smooth muscle isoform comprises only a relatively small subset of the total Myocardin transcript in cardiomyocytes. Therefore, at the depth of our RNA-seq analysis, the read coverage at that Exon was limiting and precluded detection of its differential expression with any statistical confidence. We have added a sentence to the Results to address this apparent discrepancy. We thank the reviewers for this suggestion and in response we have added Figure 1–figure supplement 5 and Figure 2–figure supplement 4 showing representative ECG tracings. We have edited the Results to be more concise and moved text to the Discussion, as appropriate. Electron microscopy analysis of P0 miR-1-null skeletal muscle showed the presence of ordered sarcomeric structures. The newborn mice were mobile and could feed, but because of their early demise, we could not assess their muscle strength more rigorously, particularly under stress. miR-206 continues to be expressed in skeletal muscle so a triple knockout of miR-1-1, miR-1-2 and miR-206 will be required to assess the consequences of complete loss of the miR-1/miR-206 family in skeletal muscle. We have added a paragraph to the Discussion addressing this interesting finding and its possible interpretations. DS: Member of the Scientific Advisory Boards of iPierian and RegeneRx Biopharmaceuticals, and Reviewing editor, eLife. The authors thank G Howard and AL Lucido for their editorial comments; B Taylor for help with manuscript and figure preparation; K Cordes Metzler, I King, V Vedantham and M White for critical discussion; A Williams, S Thomas, and A Holloway of the Gladstone Bioinformatics Core, J Wong of the Gladstone Electron Micropscopy Core, and C Miller and K Bummer of the Gladstone Histology Core for technical support. The Telokin promoter construct was a gift from P Herring. RNA from miR-133a knockout animals was kindly provided by N Liu and EN Olson. The Gladstone Institutes received support from a National Center for Research Resources Grant RR18928. Animal experimentation: This study was performed in strict accordance with the recommendations in the Guide for the Care and Use of Laboratory Animals of the National Institutes of Health. All of the animals were handled according to approved institutional animal care and use committee (IACUC) protocols (#AN086606) of the University of California, San Francisco. © 2013, Heidersbach et al.